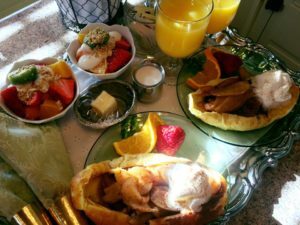 Our Holden House guests enjoy our many delicious morning entrees just like this one. 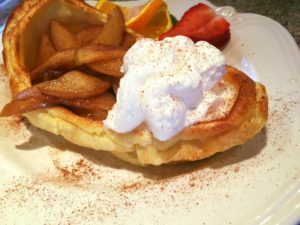 A favorite is our German Puff Pancakes with Spiced Apples. Here’s our special #recipe so you can savor the flavor right in your own home! Directions: Whip milk, flour, eggs and vanilla. Set aside. Place pat of butter in each bowl. Preheat bowls in 400 degree oven for 10-15 minutes or until butter is popping hot. In the meantime, cut apples into chunks and place in frypan with butter. Cook for 15 minutes or until apples are moderately soft. Add a bit of water if apples become too dry while cooking. 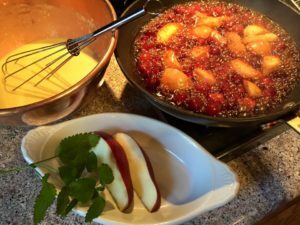 When cooked, add cinnamon, nutmeg, ginger, brown sugar and mincemeat to apples. Continue cooking another 5-10 minutes or until well mixed and hot. When butter in dishes is popping hot, add an even measurement of pancake batter to each dish. Turn up oven to 425 degrees for 10 minutes then back down to 400 for another 5 minutes or until pancakes are puffed up and slightly brown on edges. Remove from oven, slide out onto a plate and place an even measure of apples in center of each pancake. Top with dollop of whipped topping and sprinkle with fresh nutmeg. Place a wedge of apple on top as garnish. Be careful, these are extremely hot! Can also be made in a large iron skillet and cut into wedges and served on a plate, if desired. This entry was posted in bed and breakfast inn, blog, breakfast, breakfast in bed, food, foodie, Holden House 1902 Bed and Breakfast Inn, Holden House Bed Breakfast, inn, recipe and tagged Apple Recipes, breakfast, Entree, food, foodie, German Puff Pancakes with Spiced Apples, gourmet, holden house 1902 bed & breakfast inn, Pancakes, recipe by admin. Bookmark the permalink.